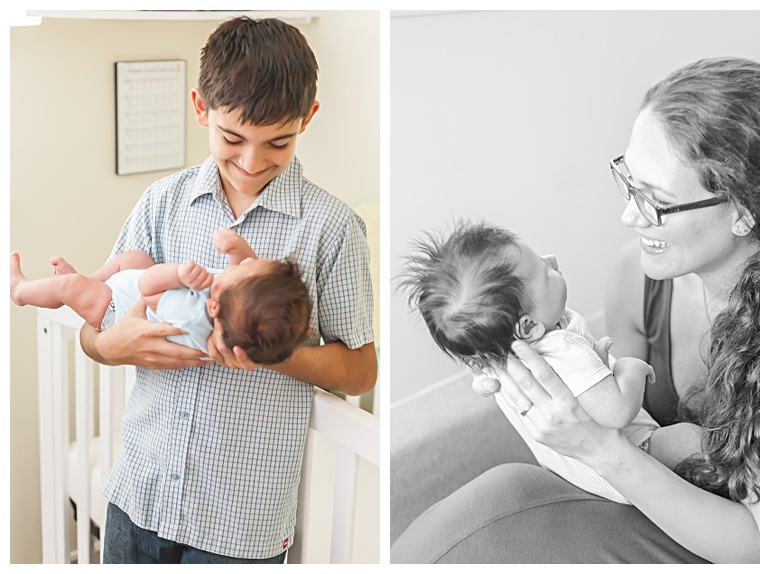 Sunny, bright in-home newborn photos celebrate a chunky baby boy! Meet Leo, a chunky monkey with tons of hair and adorable cheeks! 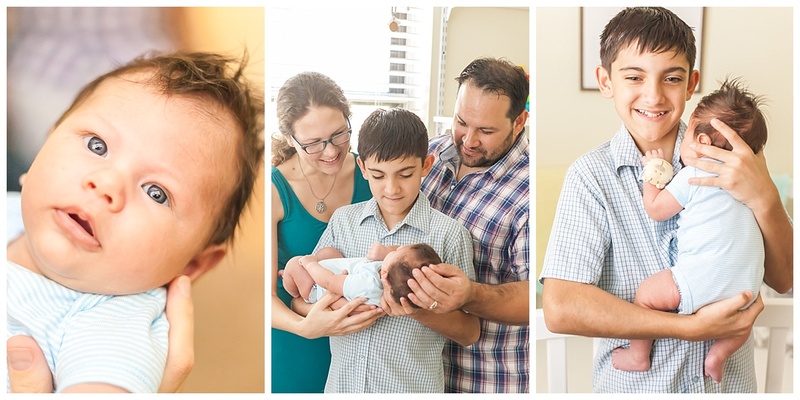 His at-home newborn session in Katy, TX celebrates how much this little guy is loved by his parents and his big brother. I photographed Shara and Nick’s sweet maternity session back in August. She was a gorgeous mama just weeks before her due date – when she didn’t know if was having a boy or a girl! When she emailed me a few weeks later to tell me little Leo was here, I was so excited to hear about her healthy, happy baby boy. 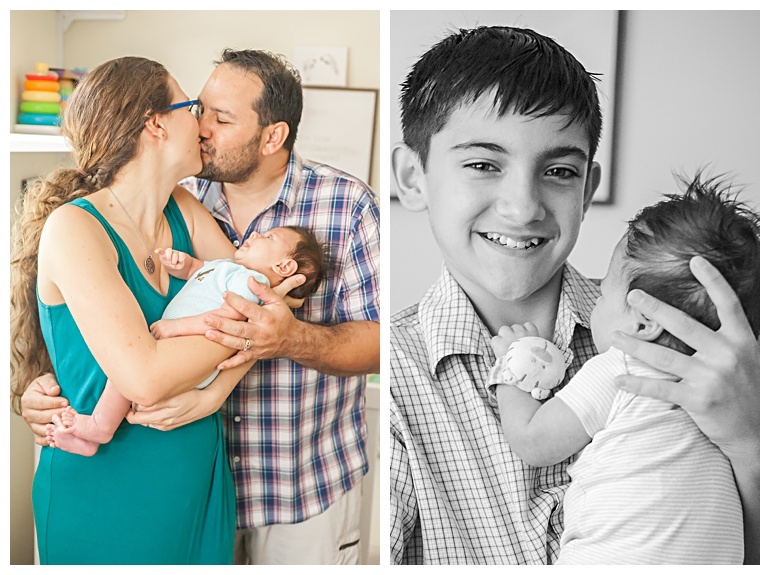 We photographed the majority of Leo’s in-home newborn session in his cheerful yellow nursery. Shara and Nick did a wonderful job making a beautiful, comfy place for little Leo to play and sleep. All of the bright sunshine pouring into his bedroom made for some gorgeous family photos. Leo was cheerful and wide awake the entire time! 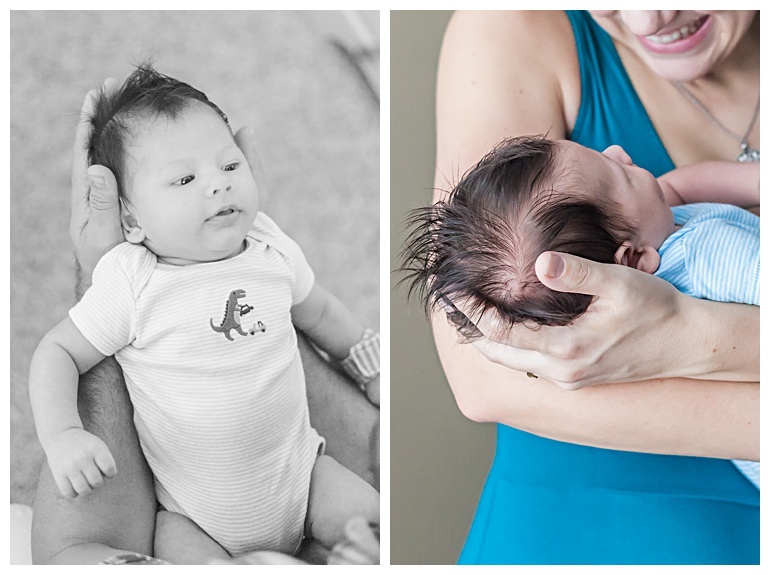 This is one big reason why scheduling newborn sessions a little later than normal is a fantastic idea. 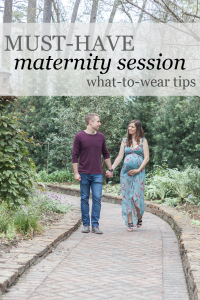 Most moms want to have photos taken right away – and I completely understand why! But waiting a little longer like Shara did is also a wonderful option, especially for first-time parents. 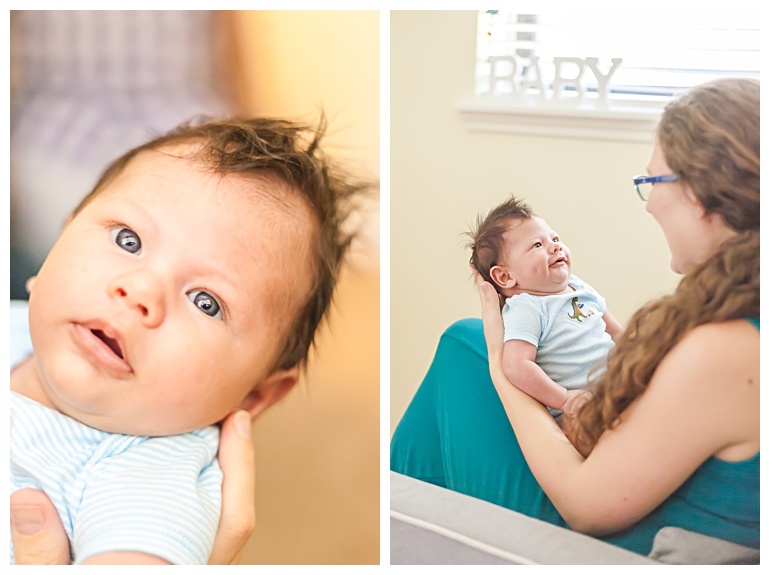 At five weeks, Leo was wide awake and full of personality during his session. We captured so many precious moments with him focused on the camera, showing off his blue eyes. Shara and Nick were more rested and adjusted to life with a new baby than they would have been at one or two weeks after birth. Whether you decide on newborn photos right away or wait a little while, they are definitely priceless memories you’ll be thankful to have for a lifetime! We set aside plenty of time to document the special relationship between big brother Ayden and little Leo. 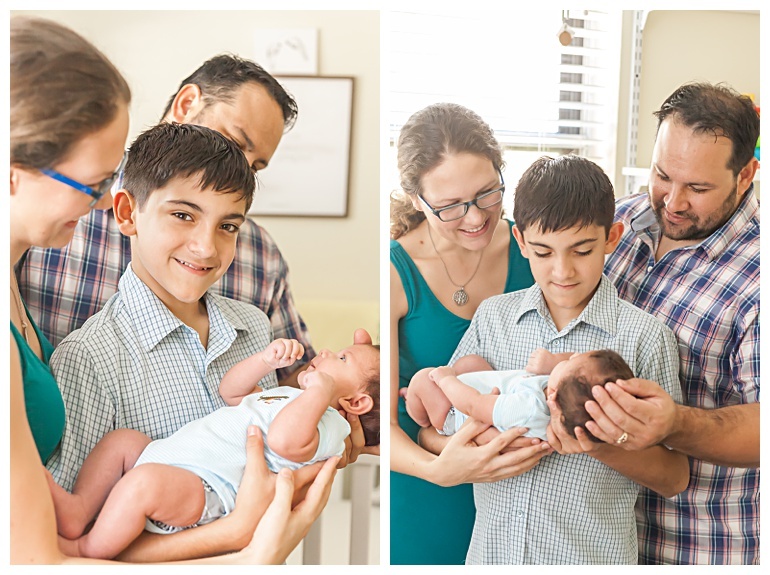 It was so sweet to watch how careful Ayden was when holding his baby brother – he’s obviously had lots of great coaching from his parents! You can see the happiness in Ayden’s eyes as he cuddles Leo, and proud dad Nick talked about how Ayden will some day teach little brother Leo how to play flag football. One thing I never had to tell Shara to do was smile while holding Leo. She is so in love with this baby boy that her proud mama smile never left her face. Shara was so full of joy and happiness – she was made for motherhood! 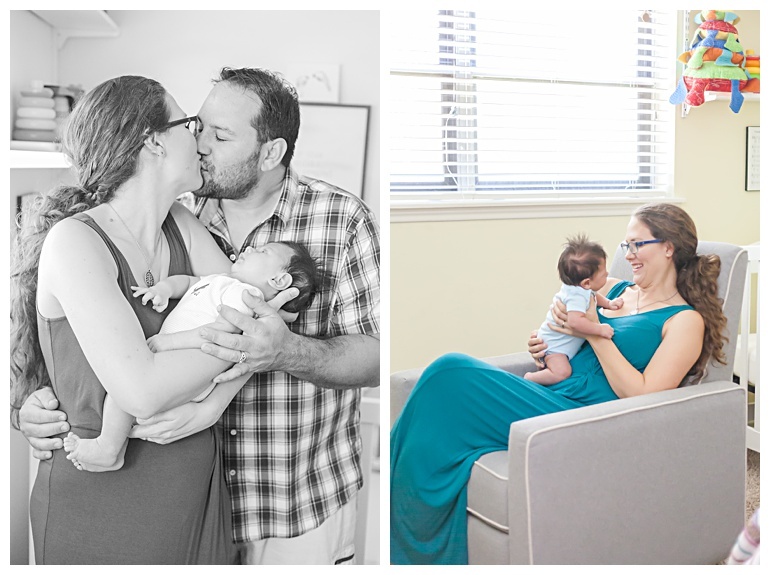 We kicked off the session with Leo and Shara snuggled in a gorgeous gray nursing chair in the nursery. Leo was so captivated by his mama – he barely wanted to look away from her! We also snapped a few sweet moments in front of the crib and with Leo playing inside the crib. Some days I am so caught up in the chaos of raising three little people whose baby days are long gone that I barely remember the beginning of motherhood, when everything was new. Days when my entire existence revolved around nursing, rocking, swaddling and cuddling. Spending time with Shara reminded me what those early days are like. There is such magic in those little moments when baby falls asleep after nursing, milk drunk and snoring softly. There is a peacefulness in your soul when you gaze into your baby’s eyes. All this love for a tiny baby who has stolen your heart. That’s the beauty of motherhood.